Created with perfection in mind, this grill combines the ultimate in precision performance with innovative design. 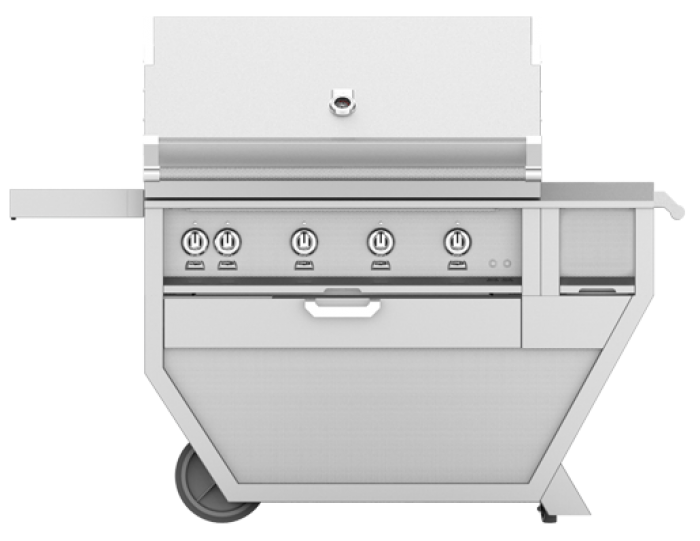 Hestan Outdoor grills are made in the USA and feature heavy gauge, welded body construction with Marquise accented control panel, Zamak die cast knobs, burner indicators and bezels and Marquise accented hood handle with commercial grade end caps that offers beauty, durability and quality craftsmanship. The Hestan 42-Inch Stainless Steel Deluxe Gas Grill on Cart With All Trellis Burners And Rotisserie features four (4) heavy duty 321 grade stainless steel Trellis tubular style burners, storage drawer, worktop and a concealed whisper-quiet rotisserie motor system that is chain driven and can hold up to 50lbs and comes with a porcelain broiling pan, rotisserie spit and forks. This grill comes packed with many convenience features that add to your grilling experience such as the spring-assist Horizon hood that make opening the hood easy and also holds the hood at a desired height. 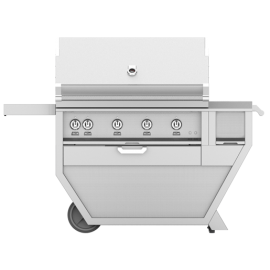 The motion activated Stadium halogen under-hood lighting illuminates the grilling area while the control panel LED lighting keeps your controls visible to help you grill and entertain at night. The symmetrical flip-to-clean radiant tray and stainless steel removable drip tray make clean-up simple and the one-push automatic ignition system makes lighting your grill a breeze. 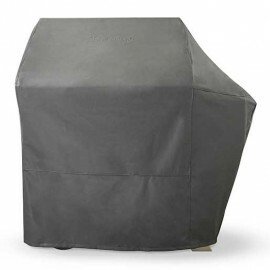 WHAT THIS LIMITED WARRANTY COVERS Hestan Commercial Corporation (“HCC”) warrants to the original consumer purchaser of a Hestan outdoor gas product (the “Product”) from an HCC authorized dealer that the Product is free from defective materials or workmanship for a period of one (1) year from the date of original retail purchase or closing date for new construction, whichever period is longer (“Limited Warranty Period”). HCC agrees to repair or replace, at HCC’s sole option, any part or component of the Product that fails due to defective materials or workmanship during the Limited Warranty Period. This Limited Warranty is not transferable and does not extend to anyone beyond the original consumer purchaser (“Purchaser”). This Limited Warranty is valid only on Products purchased and received from an HCC authorized dealer in the fifty United States, the District of Columbia and Canada. This Limited Warranty applies only to Products in non-commercial use and does not extend to Products used in commercial applications. HOW TO OBTAIN WARRANTY SERVICE If the Product fails during the Limited Warranty Period for reasons covered by this Limited Warranty, the Purchaser must immediately contact the dealer from whom the Product was purchased or HCC at 888.905.7463. Purchaser is responsible for making the Product reasonably accessible for service or for paying the cost to make the Product reasonably accessible for service. 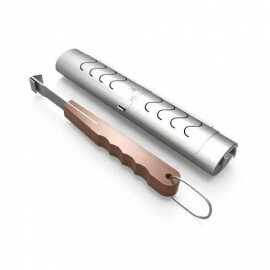 Service is to be provided during normal business hours of the authorized Hestan Commercial Service Provider. To the extent Purchaser requests service outside of the normal business hours of the authorized Hestan Commercial Service Provider, Purchaser will pay the difference between regular rates and overtime or premium rates. Purchaser is required to pay all travel costs for travel beyond 50 miles (one way) from the nearest authorized Hestan Commercial Service Provider. HOW TO OBTAIN WARRANTY SERVICE If the Product fails during the Limited Warranty Period for reasons covered by this Limited Warranty, the Purchaser must immediately contact the dealer from whom the Product was purchased or HCC at 888.905.7463. Purchaser is responsible for making the Product reasonably accessible for service or for paying the cost to make the Product reasonably accessible for service. 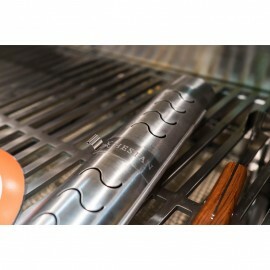 Service is to be provided during normal business hours of the authorized Hestan Commercial Service Provider. To the extent Purchaser requests service outside of the normal business hours of the authorized Hestan Commercial Service Provider, Purchaser will pay the difference between regular rates and overtime or premium rates. Purchaser is required to pay all travel costs for travel beyond 50 miles (one way) from the nearest authorized Hestan Commercial Service Provider. EXTENSIONS TO ONE YEAR LIMITED WARRANTY PERIOD: In addition to the One-Year Limited Warranty, the following components have extended warranty coverage as specifically set forth below: 1. 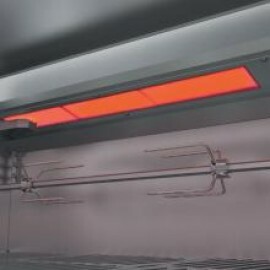 The Product’s stainless steel grill body, DiamondCut cooking grates and warming rack, stainless Trellis grill burners, Sear burners and rotisserie infrared burner (where applicable) are warranted to be free from defects in material and workmanship under normal noncommercial use and service for the lifetime of the original Purchaser. This excludes surface corrosion, scratches, and discoloration which may occur during normal use and is limited to replacement of the defective part(s), with the Purchaser paying all other costs, including labor, shipping and handling, as applicable. 2. The Product’s spit rod, briquette trays, manifolds, gas valves and sealed burner assemblies (where applicable) are warranted to be free from defects in material and workmanship, under normal non-commercial use and service, for a period of five (5) years from the original date of purchase;. This is limited to replacement of the defective parts, with the Purchaser paying all other costs, including labor, shipping, and handling, as applicable. WHAT THIS LIMITED WARRANTY DOES NOT COVER: This Limited Warranty does not cover and HCC will not be responsible for and will not pay for: damage to or defects in any Product not purchased from an HCC authorized dealer; color variations in color finishes or other cosmetic damage; failure or damage from abuse, misuse, accident, fire, natural disaster, commercial use of the Product, or loss of electrical power or gas supply to the Product; damage from alteration, improper installation, or improper operation of the Product; damage from improper or unauthorized repair or replacement of any part or component of the Product; damage from service by someone other than an authorized agent or representative of the Hestan Commercial Service Network; normal wear and tear; damage from exposure of the Product to a corrosive atmosphere containing chlorine, fluorine, or any other damaging chemicals; damage resulting from the failure to provide normal care and maintenance to the Product; damage HCC was not notified of within the Limited Warranty Period; and incidental and consequential damages caused by any defective material or workmanship. ARBITRATION: This Limited Warranty is governed by the Federal Arbitration Act. Any dispute between Purchaser and HCC regarding or related to the Product or to this Limited Warranty shall be resolved by binding arbitration only on an individual basis with Purchaser. Arbitration will be conducted by the American Arbitration Association (“AAA”) in accordance with its Consumer Arbitration Rules or by JAMS. The arbitration hearing shall be before one arbitrator appointed by the AAA or JAMS. The arbitrator shall not conduct class arbitration and Purchaser shall not bring any claims against HCC in a representative capacity on behalf of others. LIMITATION OF LIABILITY: This Limited Warranty is the final, complete and exclusive agreement between HCC and Purchaser regarding the Product. THERE ARE NO EXPRESS WARRANTIES OTHER THAN THOSE LISTED AND DESCRIBED ABOVE. NO WARRANTIES WHETHER EXPRESS OR IMPLIED, INCLUDING, BUT NOT LIMITED TO, ANY IMPLIED WARRANTIES OF MERCHANTABILITY OR FITNESS FOR A PARTICULAR PURPOSE SHALL APPLY AFTER THE LIMITED WARRANTY PERIOD STATED ABOVE. NO OTHER EXPRESS WARRANTY OR GUARANTY GIVEN BY ANY PERSON, FIRM OR CORPORATION WITH RESPECT TO THIS PRODUCT SHALL BE BINDING ON HCC. HCC ASSUMES NO RESPONSIBILITY THAT THE PRODUCT WILL BE FIT FOR ANY PARTICULAR PURPOSE, EXCEPT AS OTHERWISE PROVIDED BY APPLICABLE LAW. HCC SHALL NOT BE LIABLE FOR LOSS OF REVENUE OR PROFITS, FAILURE TO REALIZE SAVINGS OR OTHER BENEFITS, OR ANY OTHER SPECIAL, INCIDENTAL ORCONSEQUENTIAL DAMAGES CAUSED BY THE USE, MISUSE OR INABILITY TO USE THE PRODUCT, REGARDLESS OF THE LEGAL THEORY ON WHICH THE CLAIM IS BASED, AND EVEN IF HCC HAS BEEN ADVISED OF THE POSSIBILITY OF SUCH DAMAGES. NO RECOVERY OF ANY KIND AGAINST HCC SHALL BE GREATER IN AMOUNT THAN THE PURCHASE PRICE OF THE PRODUCT. WITHOUT LIMITING THE FOREGOING, YOU ASSUME ALL RISK AND LIABILITY FOR LOSS, DAMAGE OR INJURY TO YOU AND YOUR PROPERTY AND TO OTHERS AND THEIR PROPERTY ARISING OUT OF THE USE, MISUSE OR INABILITY TO USE THE PRODUCT NOT CAUSED DIRECTLY BY THE NEGLIGENCE OF HCC. THIS LIMITED WARRANTY STATES YOUR EXCLUSIVE REMEDY. No oral or written representation or commitment given by anyone, including but not limited to, an employee, representative or agent of HCC will create a warranty or in any way increase the scope of this express Limited One Year Warranty. If there is any inconsistency between this Limited Warranty and any other agreement or statement included with or relating to the Product, this Limited Warranty shall govern. If any provision of this Limited Warranty is found invalid or unenforceable, it shall be deemed modified to the minimum extent necessary to make it enforceable and the remainder of the Limited Warranty shall remain valid and enforceable according to its terms. INTERACTION OF LAWS WITH THIS LIMITED WARRANTY: Some states, provinces or territories may not allow limitations on how long an implied warranty lasts or the exclusion or limitation of incidental or consequential damages, so the above limitations or exclusions may not apply to you. Some states, provinces or territories may provide for additional warranty rights and remedies, and the provisions contained in this Limited Warranty are not intended to limit, modify, take away from, disclaim or exclude any mandatory warranty requirements provided by states, provinces or territories, including certain implied warranties. This warranty gives you specific legal rights, and you may also have other rights which vary depending on location. Any questions about this Limited Warranty may be directed to Hestan Commercial Products at (888) 905-7463.